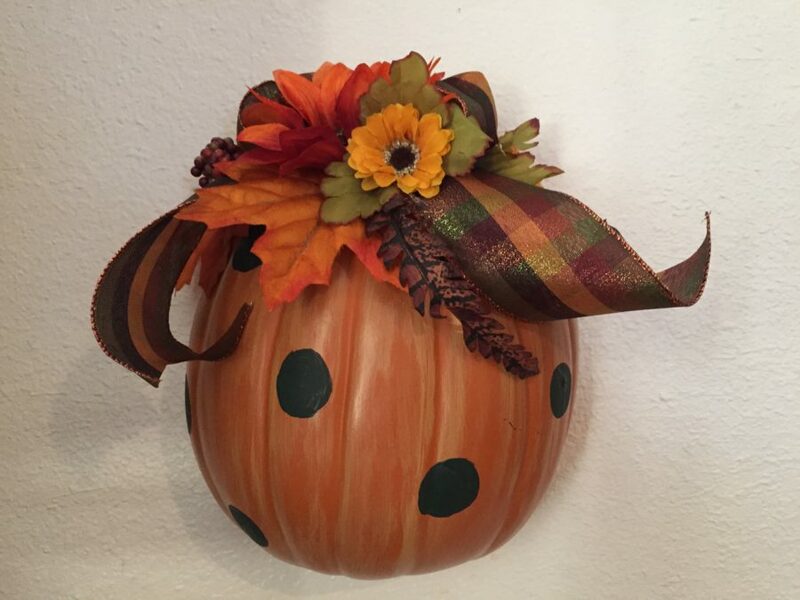 Creating Fall Pumpkin Decor is one of my favorite things to do to get ready for the Fall season. Not just because the temperatures are so much cooler, but because it reminds me that the holidays are just around the corner. From pumpkin spice everything to pumpkin decor, I just love this time of the year. It doesn’t have to cost you a fortune to decorate for fall and you can use this pumpkin décor for a few months right into Thanksgiving. 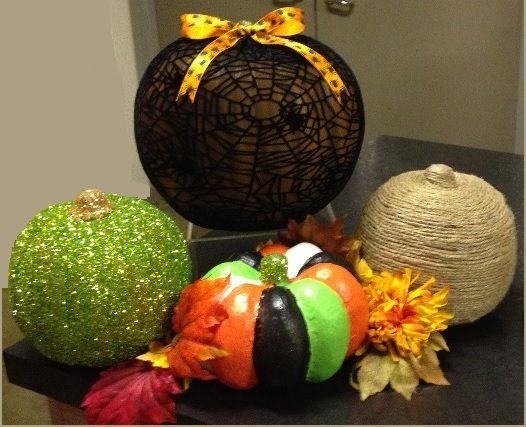 Create this pumpkin decor with just a few items from your craft store. 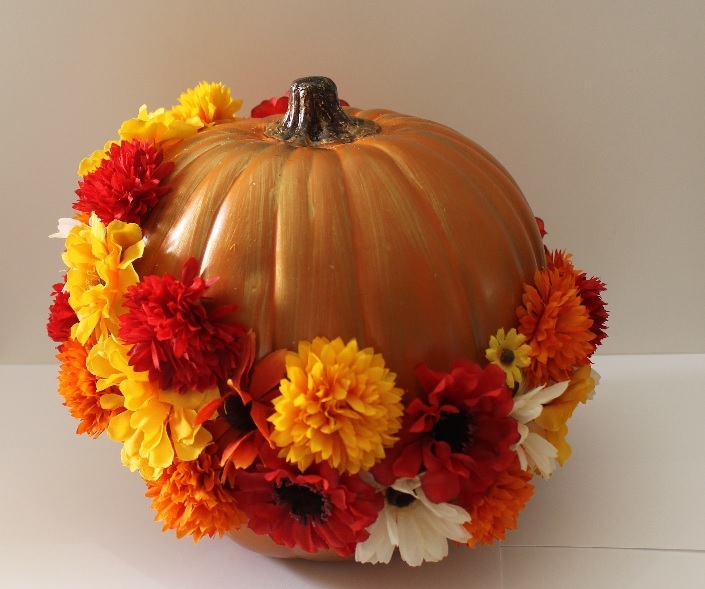 The craft pumpkins come in many sizes, so you can decorate any space in your home with these cute floral pumpkins or make a few to place all around your home. Cut the Dryer Vent to the size you would like your pumpkin to be, after stretching it and connecting each end to see the size. Using the floral wire, tie the two ends of the dryer vent together. Paint the dryer vent with your choice of Americana Multi-surface paint. Let dry, you may need more then one coat. 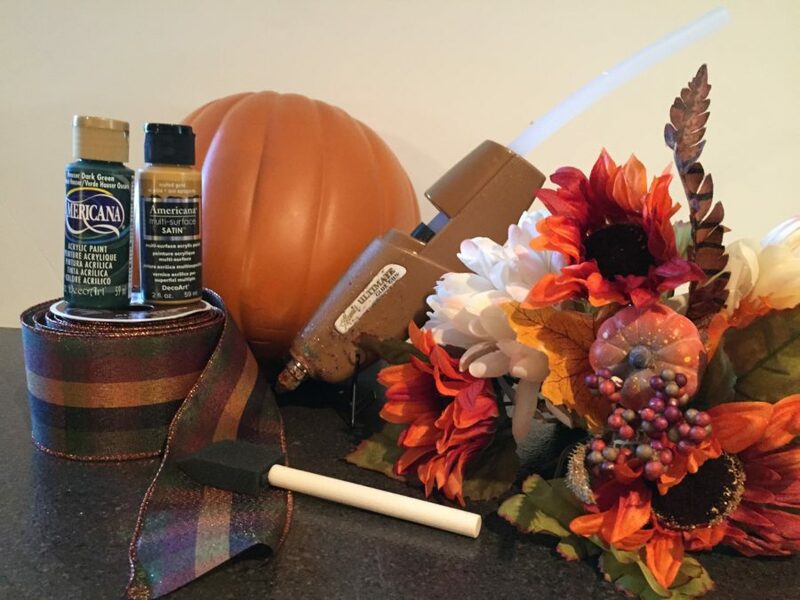 Hot glue fall flowers to the top of your pumpkin. First you want to paint a thin coat onto the outside of the pumpkin with the metallic paint. Don’t paint to thick; just lightly brush the paint on. 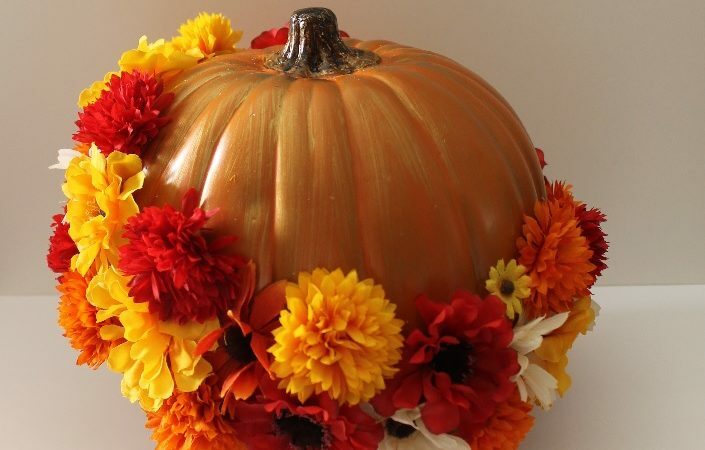 After the paint has dried start drilling your holes into the pumpkin where you would like to put your flowers. Pick the tops of the flowers off of the bush and dip the tip into the glue and place it into one of the holes you have drilled. Finish the pumpkin off with a design of your choice. Using the sponge brush, lightly paint streaks with the gold paint onto the pumpkin, do not cover the whole pumpkin with the paint, just lightly streak it. Let the paint dry at least 10 minutes. 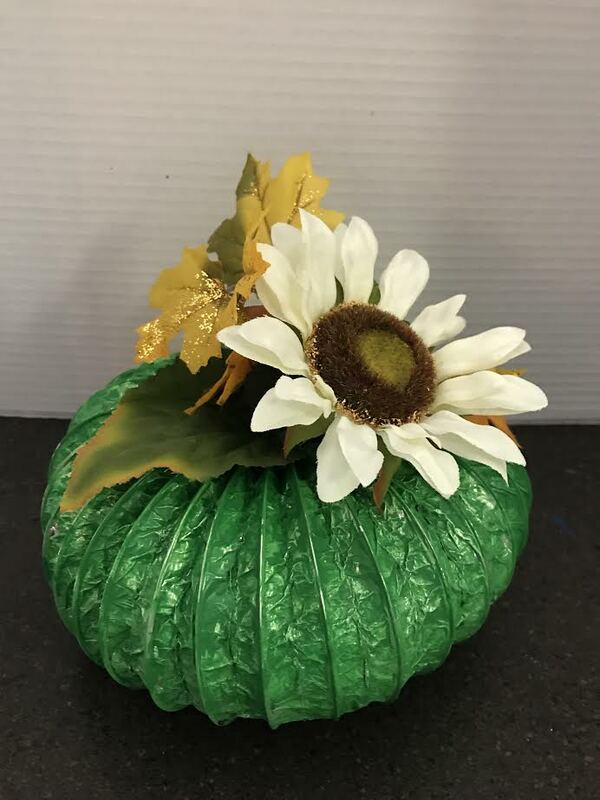 Using a clean sponge brush, dip just the tip of the brush into the green paint and twist a circle onto the pumpkin to make a polk-a-dot. Repeat this process until there are 8 – 10 polk-a-dots on the pumpkin. Let the dots dry completely, 10 – 20 minutes. Create a bow with the fall ribbon, either a shoelace bow or create a looped bow with 2 – 3 loops on each side. Hot glue the bow to the top of the pumpkin and then pull some of the fall flowers off of the bush and hot glue them onto the top of the pumpkin with the bow. Let everything dry completely and then hang it where you would like. Place 3 plates next to each other on the newspaper covered table. Working in sections and using the sponge brush, paint a small portion of the pumpkin with decou podge. 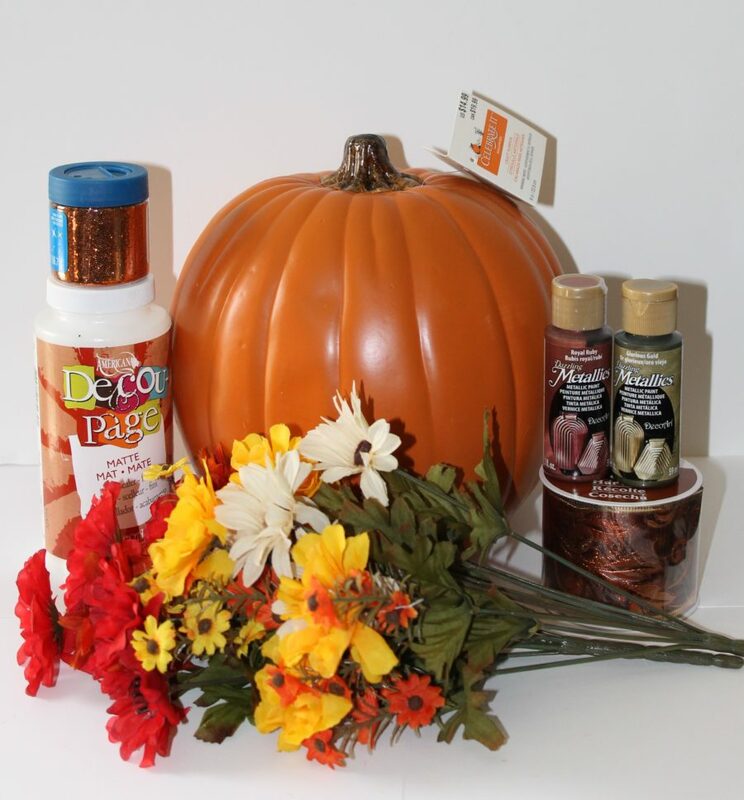 Sprinkle one of the fall colored glitters over the painted part of the pumpkin, covering the decou podge completely. Move to the next section of the pumpkin and repeat the previous steps until the whole pumpkin is completely covered in glitter. You may have to go back over a couple spots to be sure that you have covered the whole pumpkin in glitter. You can also use another color of glitter for the stem of the pumpkin; follow the previous steps to do this. For an added touch, you can also glue a fall leaf next to the stem. Let dry overnight. Next Post DIY Halloween Party Costumes, Cocktails, Treats Oh My!